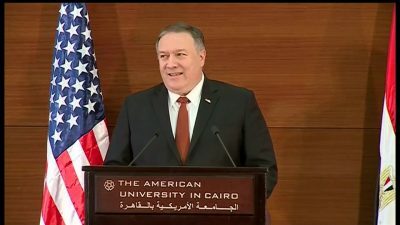 Secretary of State Mike Pompeo delivered contradictory messages in a speech in Cairo on Thursday, January 10. On the one hand, he said Washington will withdraw American troops from Syria in line with Donald Trump’s momentous announcement on December 19, and on the other, he emphasized the US will continue fighting the Islamic State and will also contain the influence of Iran in the Middle East region. Obviously, both these divergent goals are impossible to achieve, unless Washington is planning to maintain some sort of long-term military presence in Syria. In an exclusive report  by the Middle East Eye’s Turkey correspondent, Ragip Soylu, January 10, he mentions that the US delegation presented a five-point document to the Turkish officials during National Security Advisor John Bolton’s recent visit to Turkey. “Those in attendance with Bolton during the two-hour meeting at the presidential palace in Ankara included General Joseph Dunford, the chairman of the Joint Chiefs of Staff, and James Jeffrey, the US special envoy to the anti-Islamic State coalition,” according to the report. “The US is not withdrawing from the base at al-Tanf at this time,” the official said. The revelation hardly comes as a surprise, though, as John Bolton alluded to maintaining long-term US military presence at the al-Tanf base during his visit to Jerusalem on January 6. The al-Tanf military base is strategically located in southeastern Syria on the border between Syria, Iraq and Jordan, and it sits on a critically important Damascus-Baghdad highway, which serves as a lifeline for Damascus. Washington has illegally occupied 55-kilometer area around al-Tanf since 2016, and several hundred US Marines have trained Syrian militant groups, including Maghawir al-Thawra, there. Thus, for all practical purposes, it appears the withdrawal of American troops from Syria will be limited to Manbij and Kobani in northern Syria and Qamishli and al-Hasakah in northeastern Syria in order to address the concerns of Washington’s NATO-ally Turkey pertaining to the Kurdish militias which Ankara regards as “terrorists,” and the fate of US forces operating alongside Kurds in Deir al-Zor in eastern Syria and al-Tanf military base in particular is still in doubt. The regions currently being administered by the Kurds in Syria include the Kurdish-majority Qamishli and al-Hasakah in northeastern Syria along the border with Iraq, and the Arab-majority towns of Manbij to the west of the Euphrates River in northern Syria and Kobani to the east of the Euphrates River along the Turkish border. The oil- and natural gas-rich Deir al-Zor governorate in eastern Syria has been contested between the Syrian government and the Kurdish-led Syrian Democratic Forces, and it also contains a few pockets of the remnants of the Islamic State militants alongside both eastern and western banks of the Euphrates River. The Turkish “east of Euphrates” military doctrine basically means that the Turkish armed forces would not tolerate the presence of the Syrian PYD/YPG Kurds – which the Turks regard as “terrorists” allied to the PKK Kurdish separatist group in Turkey – in Manbij and Kobani, in line with the longstanding Turkish policy of denying the Kurds any territory in the traditionally Arab-majority areas of northern Syria along Turkey’s southern border. Regarding the evacuation of American troops from the Kurdish-held areas in northern Syria, clearly an understanding has been reached between Washington and Ankara. According to the terms of the agreement, the Erdogan administration released the US pastor Andrew Brunson on October 12, which had been a longstanding demand of the Trump administration, and has also decided not to make public the audio recordings of the murder of Jamal Khashoggi at the Saudi consulate in Istanbul on October 2, which could have implicated another American-ally the Saudi Crown Prince Mohammad bin Salman in the assassination. In return, the Trump administration has complied with Erdogan’s longstanding demand to evacuate American forces from the Kurdish-held areas in northern Syria. Another demand Erdogan must have made to Washington is to pressure Saudi Arabia to lift the Saudi-UAE blockade against Qatar imposed in June 2017, which is ideologically aligned to Erdogan’s AKP party since both follow the ideology of the Muslim Brotherhood, in return for not making public the audio recordings of the murder of Jamal Khashoggi. It bears mentioning that after the Khashoggi assassination and the international outrage it generated against the Saudi royal family, Saudi Arabia is already trying to assuage Qatar as it invited Qatari Emir Sheikh Tamim bin Hamad al-Thani to attend the Gulf Cooperation Council summit in Riyadh on December 10, though Doha snubbed the goodwill gesture by sending a low-ranking official to the meeting. The reason why the Trump administration is bending over backwards to appease Ankara is that Turkish President Erdogan has been drifting away from Washington’s orbit into the Kremlin’s sphere of influence. Turkey, which has the second largest army in NATO, has been cooperating with Moscow in Syria against Washington’s interests for the last couple of years and has also placed an order for the Russian-made S-400 missile system, though that deal, too, has been thrown into jeopardy after Washington’s recent announcement of selling $3.5 billion worth of Patriot missile systems to Ankara. In order to understand the significance of relationship between Washington and Ankara, it’s worth noting that the United States has been conducting airstrikes against targets in Syria from the Incirlik airbase and around fifty American B-61 hydrogen bombs have also been deployed there, whose safety became a matter of real concern during the foiled July 2016 coup plot against the Erdogan administration; when the commander of the Incirlik airbase, General Bekir Ercan Van, along with nine other officers were arrested for supporting the coup; movement in and out of the base was denied, power supply was cut off and the security threat level was raised to the highest state of alert, according to a report  by Eric Schlosser for the New Yorker. Perceptive readers who have been keenly watching Erdogan’s behavior since the foiled July 2016 coup plot against the Erdogan administration must have noticed that Erdogan has committed quite a few reckless and impulsive acts during the last few years. Firstly, the Turkish air force shot down a Russian Sukhoi Su-24 fighter jet on the border between Syria and Turkey on 24 November 2015 that brought the Turkish and Russian armed forces to the brink of a full-scale confrontation in Syria. Secondly, the Russian ambassador to Turkey, Andrei Karlov, was assassinated at an art exhibition in Ankara on the evening of 19 December 2016 by an off-duty Turkish police officer, Mevlut Mert Altintas, who was suspected of being an Islamic fundamentalist. Thirdly, the Turkish military mounted the seven-month-long Operation Euphrates Shield in northern Syria immediately after the attempted coup plot from August 2016 to March 2017 that brought the Turkish military and its Syrian militant proxies head-to-head with the Kurdish-led Syrian Democratic Forces and their US backers. Fourthly, Ankara invaded Idlib in northwestern Syria in October 2017 on the pretext of enforcing a de-escalation zone between the Syrian militants and the Syrian government, despite official protest from Damascus that the Turkish armed forces were in violation of Syria’s sovereignty and territorial integrity. And lastly, Turkey mounted Operation Olive Branch in the Kurdish-held enclave of Afrin in northwestern Syria from January to March 2018. And after capturing Afrin in March last year, the Turkish armed forces and their Syrian jihadist proxies have now set their sights further east on Manbij and Kobani. Nauman Sadiq is an Islamabad-based attorney, columnist and geopolitical analyst focused on the politics of Af-Pak and Middle East regions, neocolonialism and petro-imperialism. The “globalization of war” is a hegemonic project. Major military and covert intelligence operations are being undertaken simultaneously in the Middle East, Eastern Europe, sub-Saharan Africa, Central Asia and the Far East. The U.S. military agenda combines both major theater operations as well as covert actions geared towards destabilizing sovereign states.